Hojaldre crujiente con langostinos, espinacas y emulsión. Carpaccio de vieira con foie, remolacha y vinagreta de miel de trufa. Escalopines de Corvall con alcachofa y "beurre" blanca. Presa ibérica con parmentier de patata y pacenta ibérica. Car park en Calle Valencia. Service and food correct, music too loud and sometimes disturbing. Great execution by the chef, great wine recommendation. 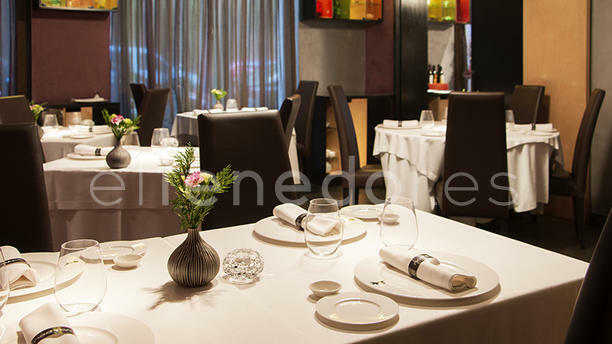 Welcoming atmosphere, attentive staff, quick drinks, innovative seasonal cuisine, chef checking that everything is fine, very good from the start to the end. The tasting menu had several culinary highlights but was little on a heavy side. The foods, atmosphere and services are really excellent! The lunch set is really worth it. Really recommend to pay a visit here! very cozy and appetizing atmosphere. lunch set menu was excellent with huge portions and great variety. Un restaurant molt agradable i tranquil, ideal per a fruir d'uns plats ben elaborats i de bona qualitat. Awesome. Bit more expensive than what I expected. Excelente. Muy buen servicio. Una grata experiencia.